Eastlake opened the ledger when Brody Leslie took a short 4th down play to the house with a 13-yard run. Moments earlier, Grady Robison had kept the drive alive with a great scramble. Broc Stauffer recovered the following long kick-off and Eastlake seemed poised to pounce with a second quick score. 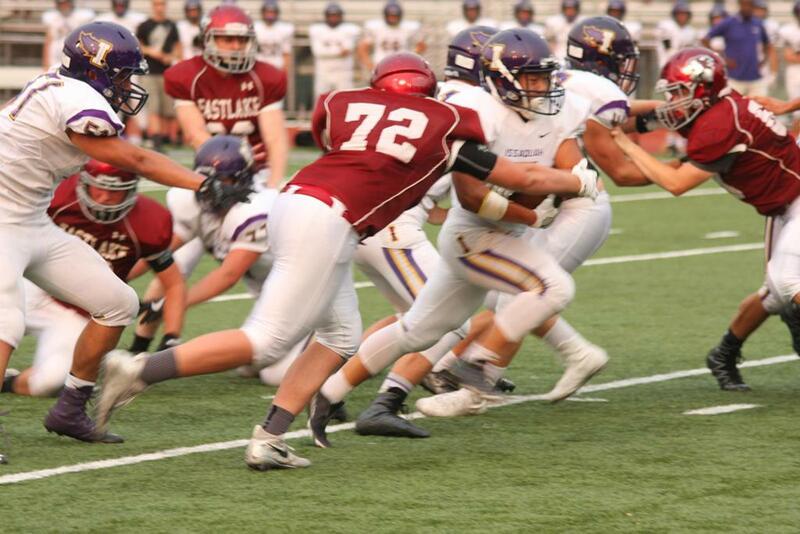 Eastlake was denied, however, and the quarter closed out with the Wolves holding a 7-0 lead. In the second quarter, the Eagles pushed forward and punched the ball in the endzone but Eastlake held the lead as the PAT was kicked wide-left. Both defenses tightened down to finish the half. Eastlake had a defensive stop inside its defensive redzone and later saw Cameron Knutsen stunt another Issaquah drive with a sack. The first half finished with Eastlake leading, 7-6. The second half opened with a big sack by Sam Marks and then an interception by Stauffer at the Eastlake 14, the second redzone stop of the night for the Wolves. The tide turned on the next possession with Issaquah scoring on a 15 yard touchdown pass and then a 2-point conversion. Issaquah then forced a safety and quickly found themselves on top, 16-7. The Eastlake boys continued to fight. Midway through the fourth quarter, Robison extended a play with a scramble to his right and eventually found Ryan Cole downfield. Cole's leaping grab and subsequent run completed a 50 yard touchdown play. With 4:40 on the clock and the score 16-14, Eastlake was just a defensive stop and a score from regaining the lead. The defense held, buoyed by stout defensive line play by Cameron Lynch and Conner Jolley. With 3:00 remaining, Eastlakes defense returned the ball back to its’ possession on Issaquah’s side on the field. The offense pushed on, converting a couple more critical 4th downs, include a tough run by Matt Brookshier. On this hot night however, Eastlake was to be denied. Issaquah was able to regain the ball and on a 4th down on it own 3-yard line, Issaquah was able to run the clock out and the game finished 16-14 in Issaquah’s favor. 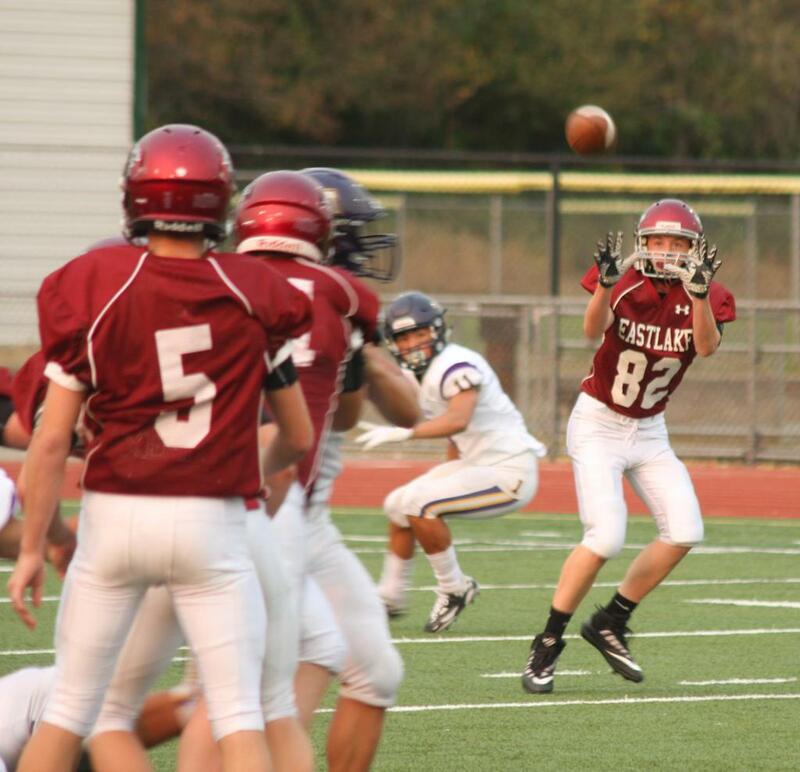 Eastlake JV hopes to rebound against Woodinville at 6:00 pm next Monday at Eastlake Stadium. Please come out and show your WSPS pride.